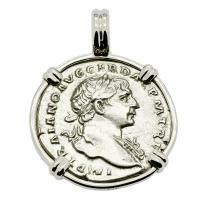 Roman Empire AD 103 - 111, Emperor Trajan & Roma denarius in 14k white gold pendant. 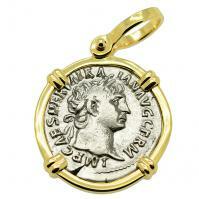 Roman Empire AD 98 - 117, Emperor Trajan & Aequitas denarius in 14k gold pendant. 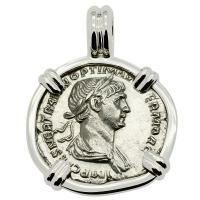 Roman Empire AD 115 - 116, Emperor Trajan & Pax denarius in 14k white gold pendant. 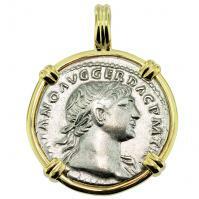 Roman Empire AD 101 - 102, Emperor Trajan & Victory denarius in 14k gold pendant. 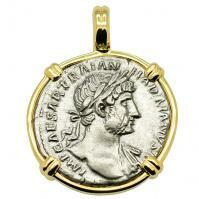 Roman Empire AD 117-138, Hadrian & Felicitas denarius in 14k gold pendant. 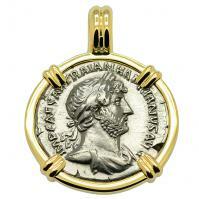 Roman Empire AD 117-138, Hadrian & Clementia denarius in 14k gold pendant. 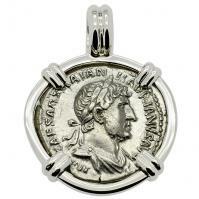 Roman Empire AD 117-138, Hadrian & Salus denarius in 14k white gold pendant. 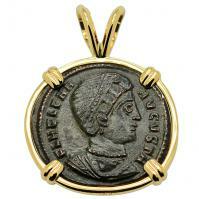 Roman Empire AD 324–328, Saint Helena follis in 14k gold pendant. 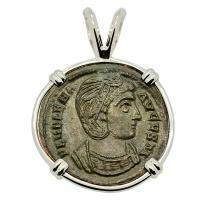 Roman Empire AD 326–327, Saint Helena follis in 14k white gold pendant. 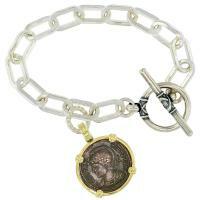 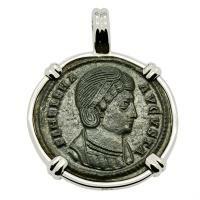 Roman Empire AD 327–329, Saint Helena follis in 14k white gold pendant. 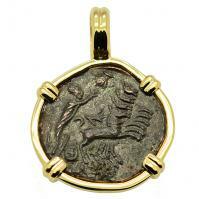 Roman Republic 120 BC, Janus & Roma denarius in 14k gold pendant. 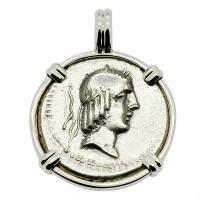 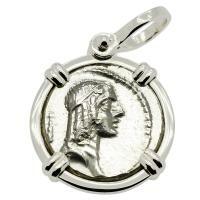 Roman Republic 90 BC, Apollo & Horseman denarius in 14k white gold pendant. 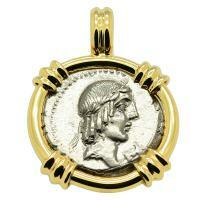 Roman Republic 84 BC, Apollo with thunderbolt denarius in 14k gold pendant. 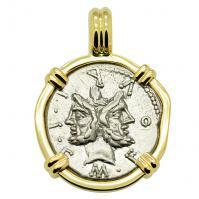 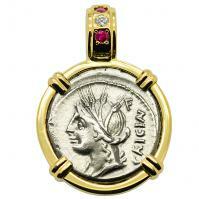 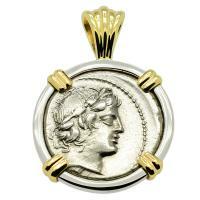 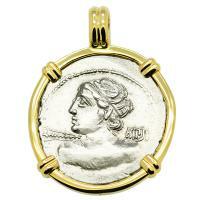 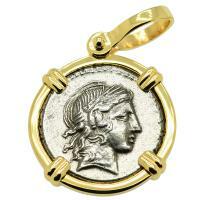 Roman Republic 82 BC, Apollo and Satyr Marsyas denarius in 14k white & yellow gold pendant. 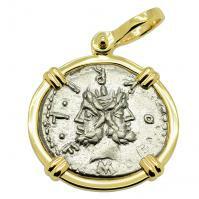 Roman Republic 82 BC, Apollo & Satyr Marsyas denarius in 14k gold pendant. 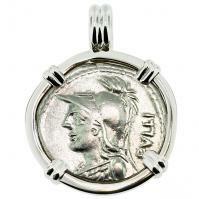 Roman Republic 61 BC, Apollo & Horseman denarius in 14k white gold pendant. 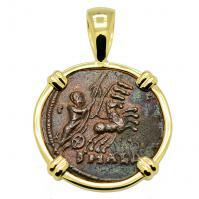 Roman Republic 90 BC, Apollo & Horseman denarius in 14k gold pendant. 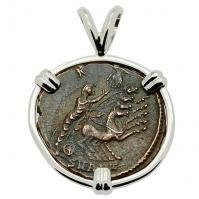 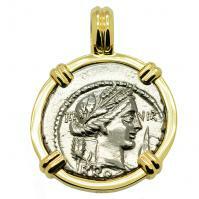 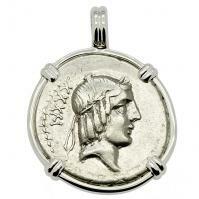 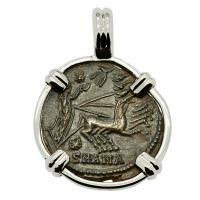 Roman Republic 100 BC, Minerva and Victory chariot denarius in 14k white gold pendant. 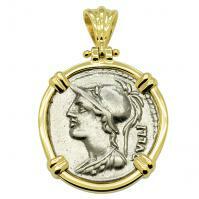 Roman Republic 100 BC, denarius with Minerva and Victory Chariot in 14k gold pendant. 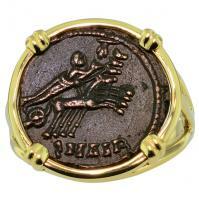 Roman Antioch AD 337-340, Constantine the Great follis in 14k gold ladies ring. 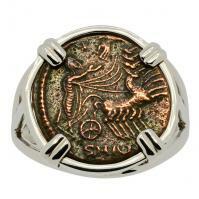 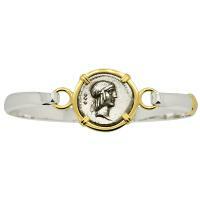 Roman Antioch AD 337-340, Constantine the Great follis in 14k white gold ladies ring. 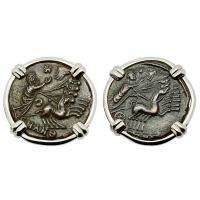 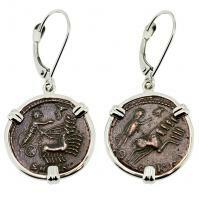 Roman Antioch AD 337-340, Constantine the Great coins in 14k white gold earrings. 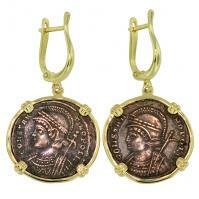 Roman Antioch AD 337-340, Constantine the Great coins in 14k gold earrings. 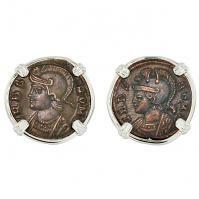 Roman Empire AD 330 - 333, Roma & Suckling Twins nummus in 14k white gold earrings. 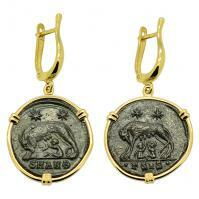 Roman Empire AD 330 - 336, She Wolf Suckling Twins nummus in 14k gold earrings. 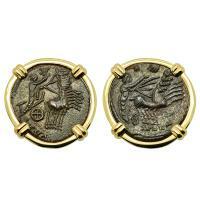 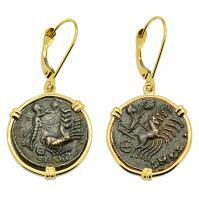 Roman Empire AD 330-346, Constantinopolis & Victory follis in 14k gold earrings. 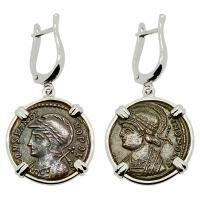 Roman Empire AD 330-346, Constantinopolis & Victory follis in 14k white gold earrings.